At Robinsons Beds we make a wide range of great quality divan beds and upholstered bed frames, ottoman storage beds and divans with under bed storage drawers in many different fabrics, colours and sizes. We also specialise in making odd size beds, contemporary divan beds and bespoke made to measure sizes for any bedroom including high bed frames to make it easy to get in and out of bed, low bed frames and short divan beds to fit any space. All our handmade divan beds and bases are manufactured in our Glasgow bed factory workshop established in 1975. 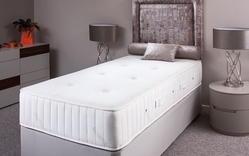 Robinsons Beds Scotland make the finest quality divans with incredibly comfortable mattresses and modern designer headboards in many different materials and colours to suit your bedroom. Our bed and bedroom furniture Showroom displays Scotland's best range of luxury upholstered divan beds handmade by our experienced craftsmen and we are open 7 days or to buy online 24/7. We specialise in making divan beds in odd sizes, shorter length divan beds, extra wide and extra long single divan beds and strong and sturdy kingsize and superking beds for heavy people. If you prefer low profile beds or higher beds suitable for the elderly and infirm for ease of getting in and out of bed we will make a customised high or low divan bed to the exact height and size you require. 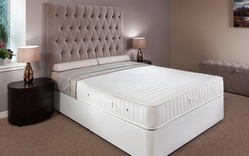 Any high or low bed comes in the standard sizes including single, double and kingsize. We deliver throughout the UK including to London, Edinburgh, Manchester, Birmingham, Liverpool, Newcastle, Cardiff, Glasgow, Aberdeen, Kent, Surrey, Sussex, Suffolk, Hertfordshire, Bedfordshire, Buckinghamshire, Oxfordshire, Cambridgeshire, Lincolnshire, Wiltshire, Hampshire, Dorset, Devon and the South West, Cheshire, the Midlands, East Anglia, the North West of England and the Highlands of Scotland. As a well established manufacturer of all types and sizes of modern divan beds with or without storage we are a Scottish based bed shop you can trust and all made here in Britain. All the divans in our comprehensive range are made to the the same high standard of workmanship; so whether it's your child's first bed or your very own luxurious design created to order, each bed is hand crafted using today's finest materials carefully chosen for a top quality product you can rely on.